Tim Foust, Rob Lundquist, Austin Brown, Adam Chance, and Adam Rupp pose for a picture so the fans can get a perfect shot to post to social media. The University of Missouri- St. Louis' Touhill Performing Center was the perfect venue for vocals to blend together. When I was younger, country hits by Toby Keith, Gretchen Wilson, Rascal Flatts, and Keith Urban would play on cassette in the car. Since then, my taste in music has shifted to pop and essentially anything that plays on 96.3 or Z107.7. Anything categorized under “country” has not sparked my interest since classic hits like “These Days” by Rascal Flatts and “Courtesy of the Red, White and Blue” by Toby Keith, both released in 2002. 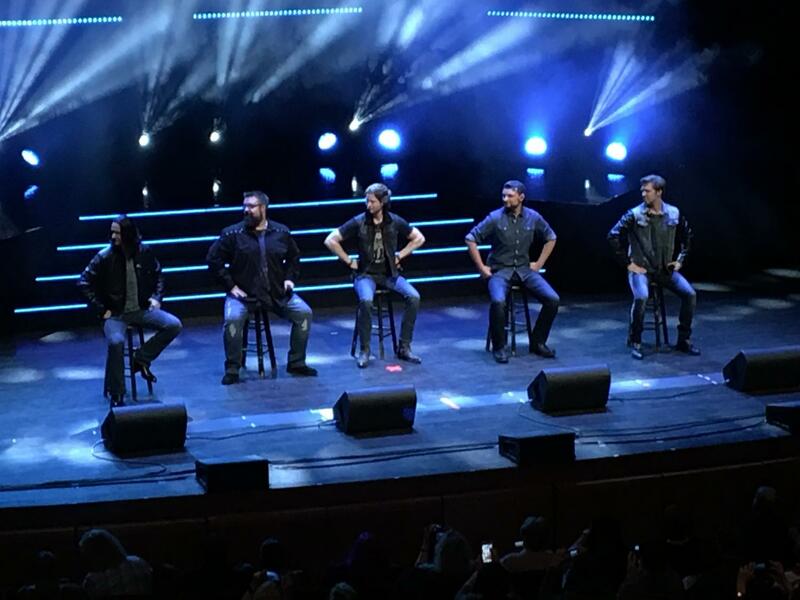 Home Free, an up and coming country a capella group who won The Sing-Off, has definitely rekindled my love for old country hits since seeing their concert a few weeks ago at the University of Missouri- St. Louis Touhill Performing Arts Center. The venue was small and intimate, but there were so many people, there is no doubt this group could have sold out an arena. Members Tim Foust, Matthew Tuey, Austin Brown, Adam Chance, and Adam Rupp not only create such a sound that resembles those of popular A Cappella group Pentatonix, but they are very personable during their concerts and even invited an audience member on stage during the show. They love audience engagement and encourage this on social media. I felt like I was at a stand-up comedy show in addition to a real concert. They make such an effort to connect with the audience through their music and offer many opportunities to meet them after the show. It is safe to say the love for their fans is more evident than any other group I could think of. I credit this to the fact that they have been dependent upon fan’s support since the beginning of The Sing-Off. Their repertoire consists of classics like “Ring of Fire” by Johnny Cash to more poppy songs like “Castle on the Hill” by Ed Sheeran. Their sound is old-fashioned yet refreshing with the spin they put on each track they cover and within their original songs. The most intriguing part of the show by far was founder Adam Rupp’s “drum solo”. I have never seen someone beatbox for so long continuously. It really sounded like you were listening to someone playing a set of drums. I don’t know how he managed to breathe during his solo with all the complex beats and sounds effects he was making. The band appeals to people of all ages and this was evident, as the demographic of the audience was very diverse. There are so many ways in which this group draws in an audience and their vocal blend is just one aspect.